I don’t think anyone is getting tired of leopard print. It is still featured across fashion brands, in dresses, skirts, accessories – in fact, pretty much all articles of clothing. Despite it being all over the place, it is only in the latter half of last year that I found some pieces that I really liked and were not too expensive. As I want to share more fashion content on here, I thought I would talk about how I have been styling my two leopard print pieces. 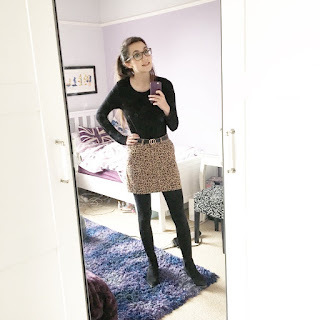 Whilst I have seen other animal prints feature a lot more in clothing, I still think leopard print is my preferred style, and will be the one that stays in style the longest. 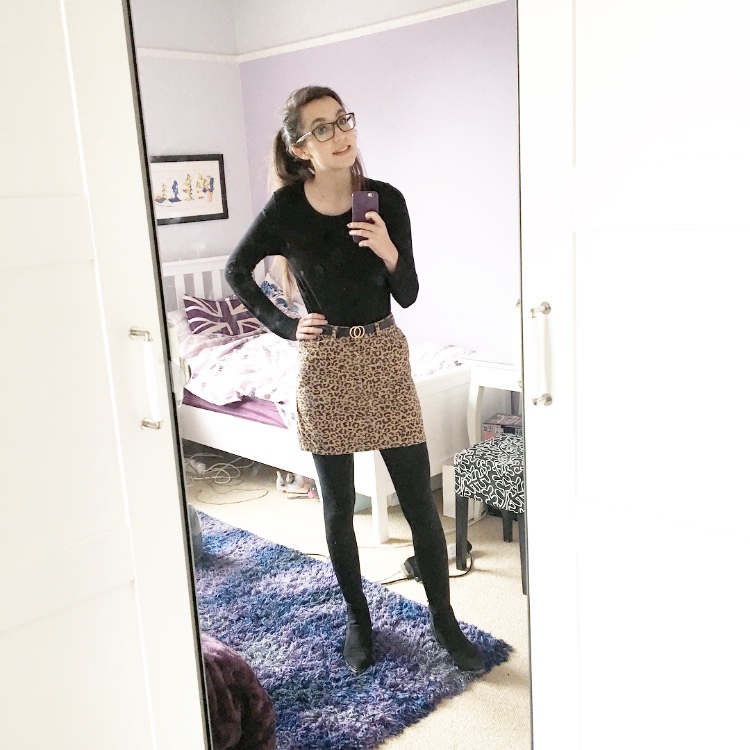 I bought this New Look skirt from ASOS back in October and it quickly became one of my favourite pieces in my wardrobe. This skirt brings out the classic style that I used to wear all the time. The only gripe that I have is that I wish it was slightly more high-waisted, but I would have needed a slightly smaller size. Sadly it is not available anymore. One item that I love pairing with this skirt is my H&M belt. I think golds and leopard print work really nicely together. I wear this belt with so many outfits! I will admit that I am a lot less adventurous when it comes to styling this skirt. I tend to stick with very plain tops, predominantly black. The print is a lot more concentrated in comparison to the coat so if I wear anything else with another pattern or any large images on it, it can look a little too busy. If I could wear this coat every day for the rest of my life then I would. Happily. Forever embracing my inner Bet Lynch. 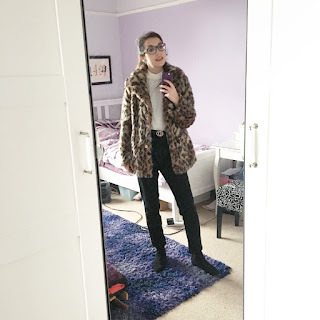 I had been looking for a leopard print coat that did not cost a fortune for ages to put on my Christmas list, and I eventually found this gorgeous coat from George. I also pair the H&M belt when I wear any of my straight leg jeans, I saw it paired with my blue pair in the store, and I have loved combining the two ever since. I feel like I can pair this with a lot more outfits than the skirt, but at the moment I love pairing it with straight-leg jeans. You might have seen it feature on a few of my outfit posts on Instagram, and definitely into the future as well. I'm not sure if this is still available, it is out of stock on the website and had been in the sale but I am not sure if they are bringing it back. They might not be the most fashion-forward ways to style print, but they are great day-to-day outfits that I think can be styled to work for casual and dressy occasions. I can definitely see my collection of leopard print expanding over the years – I think boots are calling me at the moment! Do you love leopard print? I love the coat! I used to have one when I was little! I’ve never thought to wear leopard print since as it’s something I don’t usually wear and a bit loud for me, but I love how you’ve styled them and makes me want to try stepping out of my comfort zone. Animal prints are always something I've been afraid of wearing! They're so loud and stand out, whereas I'm so shy! You look absolutely fabulous in these! I love leopard prints and the way you have styled the 2 pieces. As a mature lady I have to be careful how I wear them or I definitely look like Bet Lynch! I have some leopard print court shoes from George. They look great with a black blouse and black skinny jeans. Ooooh I love this outfit so much! You look absolutely amazing!